No business is too small to reap rewards from having an online presence. If you have a business or sell a product or service you should definitely have a website. Even if you feel that your service can’t be sold online continue to build a website. In today’s internet driven world any business can profit from online advertising. Millions of consumers are online everyday looking for countless products and services. If you do not have a website you are missing out on one of the best ways to reach customers directly. This doesn’t mean your should focus your entire marketing scheme toward online efforts, but you must develop a site that will benefit your business. With a website customers can easily find information and details about your business with the click of the mouse. You can not replicate online capabilities in any other form. 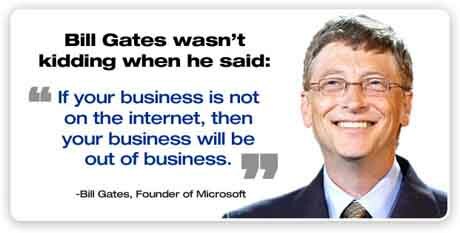 Just having a website is not going to gain you instant success. It is imperative that your site is organized and detailed, while being displayed in a professional manner. Your site must capture the consumer immediately and shed a positive light on your business. There are even website designers that will do the work for you in a manner that is quick and effective. Your business will only be taken as seriously as the persona your site exudes. In the end, websites can breakdown barriers and allow your business to compete with much larger companies. The broad scope that online marketing covers is immeasurable. Instead of becoming frustrated with your inability to grow your business quickly, focus your energy on creating an online presence. With a functioning website and a useful product your achievements will be limitless. There is no business that would not benefit from having a website to attract customers. Previous Previous post: What does your tradeshow booth say about you?